The Ruddy Duck is a small diving duck that sometimes sticks its tail upward while swimming. 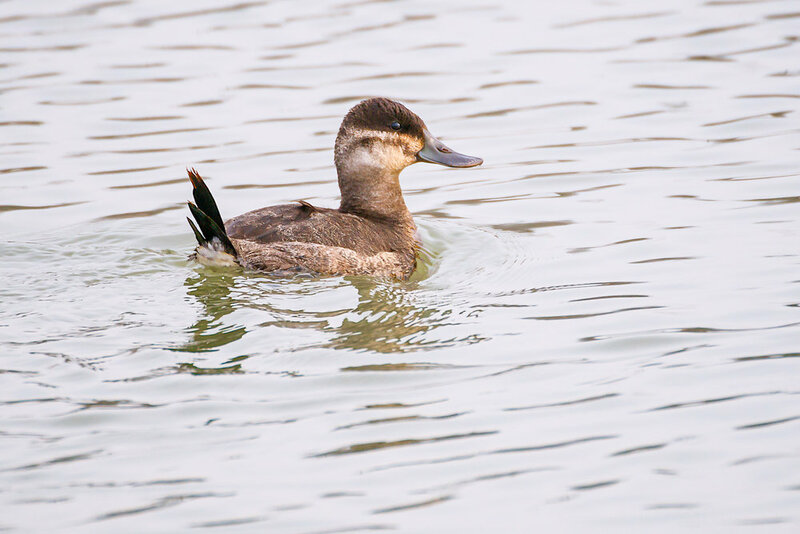 The Ruddy Duck in this photo can by identified as female by the brown stripe along her cheek. A non-breeding male would look similar but without the dark stripe. The female above appeared curious about me. I stood on an observation platform just off the water. She slowly swam up from downriver, moving closer and closer to the platform. When she reached the platform she swam back and forth a few times watching me. Eventually she slowly swam back the way she'd come. I don't know if she was expecting food or was just curious. It was a bit of a dreary overcast January morning, but I still enjoyed watching and photographing this small duck. The Ruddy Duck above is a male that is transitioning between its winter plumage and its more colorful breeding plumage. Its bill is taking on that more blue tone and its body feathers are transitioning from a grey tone to a beautiful rusty red. As with the female further up, this male Ruddy Duck seemed curious about us. My father and I stood on a boardwalk that crossed a small body of water. The duck swam towards us from the larger body of water. It was swimming almost directly towards us, turning its head to us as it approached. It swam under the boardwalk to the end of the inlet, then back in our general direction and eventually back out to the river. I love watching these ducks, especially when they appear so curious.